If you're unsure that your signature complies with the rules, post here and either an authorized signature checker (listed below) or any SPPf staff member (mod, smod, or admin) will tell you if your signature abides by the SPPf Signature Rules. -This thread is for asking about if your signature (or future signature, if you want to put something in a post and ask if that would hypothetically be okay) follows the rules. This is not for asking for help about how to create a signature. The FAQ has some information about how to do various things with your signature. If you need help with something else, look around in Newbie Lounge, as there are many threads with lots of good information about signatures. If you still cannot find what you are looking for, you may send a private message to either me or someone else who checks signatures frequently in this thread, and we will try to help you with your question. -While not in the rules, A "Bandwidth Limit Exceeded" notice will give you an automatic fail. 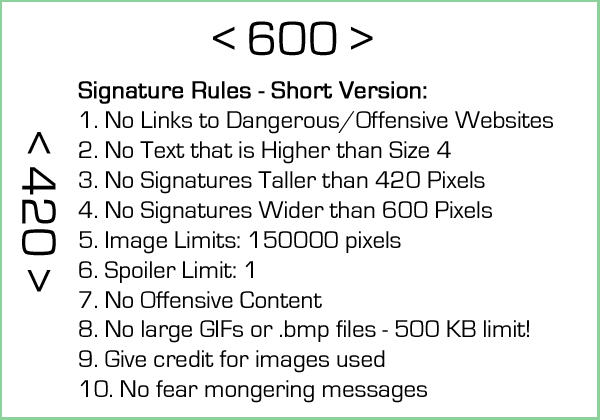 Many of these notices will be not the same size as your intended image, and subsequently we can't check the signature that you're intending to show. To prevent this, We recommend that you host the images that you intend to have in your signature. Remember, If you're hosting the image you are free to remove the image when ever you want. Of course, The Image removed notice will also result in an automatic fail. -Do not try to check someone's signature if you are not a checker. In the distant past, anyone was allowed to check signatures and this led to a lot of people telling others wrong information, which led to chaos. This is why we have specific people who are allowed to check. If you try to check someone's signature and you are not a staff member or on the allowed list, you will be warned or infracted. Also, if you see someone else doing so, don't mini-mod and tell them, use the Report button or PM a moderator of Newbie Lounge. -If you need to split/resize a banner or image in order to make it follow the signature rules, you can easily do so on Paint (which comes on every PC, though unfortunately not Macs) yourself. You can PM someone who checks sigs often in this thread either to have them do it for you or teach you how to do so yourself. If you need splitting, you can also use this neat online tool that will make perfect splits for you. The Fan Art Shops Section can also help, however it is still up to you to make sure you follow the rules. -While you cannot be "striked" right away after asking for a check in this thread, this does not give you permanent immunity. If you do not follow what a checker tells you to do and change your signature within two days, you will still receive any punishment you would have. Also, this does not count if you ask for a check then change it to something else (which breaks the rules) after getting it checked, you will still get the strike no matter how much time has passed. The definition of this 2 day safe period is upto the staff members Applying/removing the strike, however, 48 hours is generally used. Note that mistakes do sometimes happen. If you receive a strike when you were still on your "safe" period, or if a checker told you incorrectly that your signature was fine when it wasn't and you received a strike, contact me or another mod/above and we will resolve it for you. -We may accidentally skip you, especially if you posted at the same time as we were. If you get skipped and the checker who posted after you doesn't edit their post to include you soon after, calmly say "Hey, I was skipped, can I please get my signature checked?" or something. Don't be rude about it. We make mistakes sometimes too. -Please don't ask to become a checker. When checkers are needed, the staff members who check often will either ask people individually to be checkers or create an open test for anyone who wants to be one to take. Right now, none are needed, so there is no reason to be asking. -This doesn't exactly go here, but I've had enough questions about it, so here we go. If you see someone with a rule-breaking signature (not posting in this thread), you can PM it to me or another mod/above to deal with. Using the Report button doesn't always work because not everyone who deals with reports checks them or bothers with signatures. Well, that's all for now. Happy checking! -I do Sig Checks are usually done after other Staff related duties. I try to do at least one Signature Check per day. - If not other staff may do it. -When Checking I often Make my web Browser window about 600 Wide, which forces any content that can fit side by side to move on to the next line, using the web browsers "Word Wrap". This does have an effect of making your Signature taller than on your screen. If your Signature can't fit within 420 Pixels tall when my window is about 600 wide, I'll usually note is as with the the word "Wrap" or Wrapping in the notice. 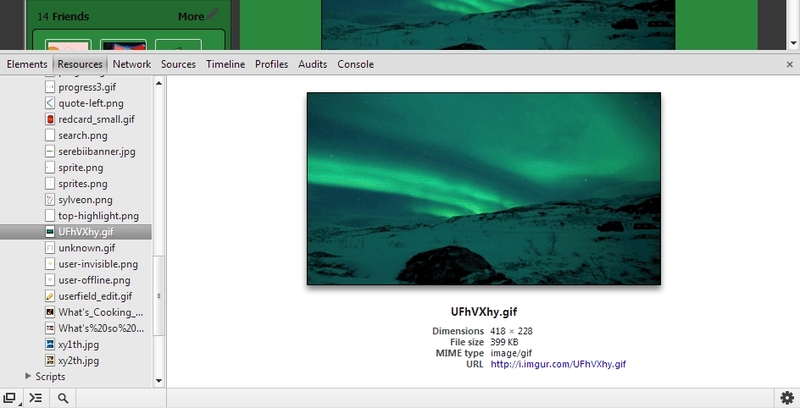 -While you can use TinyURL links for a signature image. We strongly recommend that you do not use TinyUrls for images. It is not needed as there is no character limit for this Signatures, and on my system they do not always show. TinyURLs actually change after a while, and no one knows what it replaces your image, you may end up appearing to use banned content. If you are found with a TinyUrl as a image location, it will automatically be fail. - If you do post to get a sig check and then Delete your post before an offical sig check: You will forfit your immunity against Strikes. Most staff can't see deleted posts here, and if they don't see your post they will apply strikes. -All SPP Staff have ability open a window that allows them to edit a signature, we can see code like [B] or [i]. We can easily see when you're using large fonts. -This thread only checks if you're following the rules. This thread in games rates the signatures actual content, and is open to all for checking. Remember you are responsible for what you place in your signature. I've had a few people ask me now about how to check image sizes by yourself, so i figured i'd let everyone know at once. it changes depending on what browser you're using, and i only have windows so if you are on a mac this might work differently. i don't really know. sorry mac users. you kinda brought this upon yourself by buying a mac. 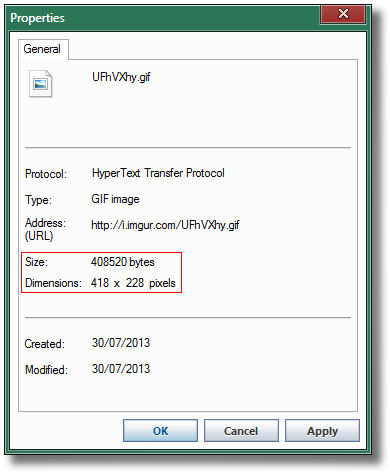 internet explorer only displays the image size in bytes for whatever reason. to convert this to kilobytes, just open up windows’ calculator and divide the value (in this case 408,520 bytes) by 1024.
alternatively, install an extension like this one that adds a "View Image Info" option to the right click context menu. it works pretty much exactly the same as firefox's. as far as i know, these browsers don’t have anything like firefox and IE’s really convenient features. to view the file size, you’ll have to save the image. to see if your image fits under the 150,000 pixel limit, use the calculator again and multiply the two dimensions (in this case, 418x228). if you are still unsure if it fits within the limits, please post so i (or someone else) can check it. 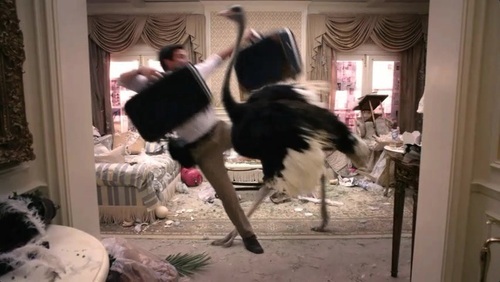 27 August 11 - Notes about tinyurls and a few other things. 26 September - Removed Golden Pure due to inactivity, and rule breaking. All approved Sig checkers are Staff. 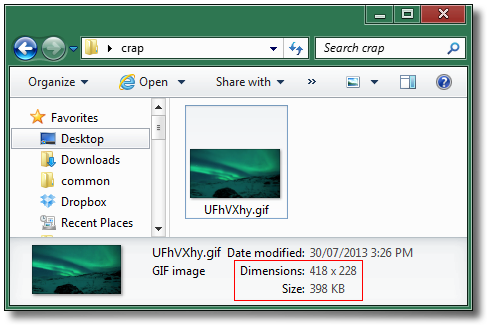 30 July 2013 - "how to check your own sig"
11 August 2014 - Added an image for comparing sig sizes too. Can I get a check under the new rules please? I made the image. How about now? Sig check. http://gyaradislake.chatango.com/ <--- Chat for da real 1337's. Sig check please? I made the image. Can you check my sig, please? Some user is complaining that I have too many images in it. Skater Trainer: It's fine if you made the banner. HarukaShuuFan986: It's fine if you made the banner. AstralEon The one and only. I need a check on mine, just in case. Check please, since there are new rules. Both team poses and claim-list image were made by me. AstralEon and Sapphire Phoenix, both of your signatures are good. Is my sig still OK? SoulSilverDSiXL I know, Bad name! ㄩ ώïll ḋø ώhατ ï ṡαÿ!! Could I have a signature check please? Master Blastoise, it's alright. Usually if your signature was okay under the first set of rules it's fine under these new ones. SoulSilverDSiXL, it's alright. Though, the image is broken so you might want to fix that. umbreon_shadow27, you're only allowed one spoiler tag in your signature, and when both are expanded your signature exceeds the height limit which is 420 pixels. Click here for a reference to height. How about mine, is it OK?